Communication is just one tool to convey brand message. 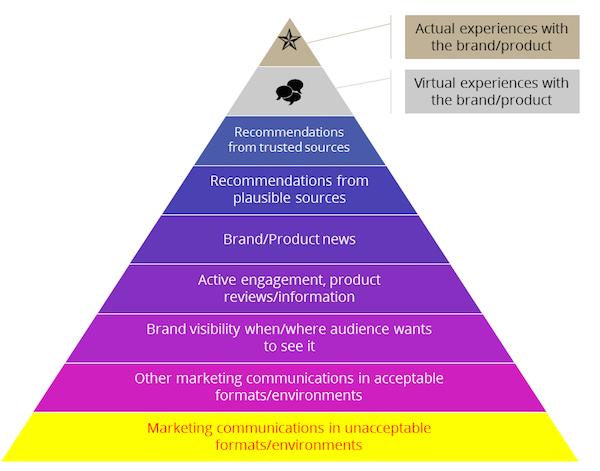 Marketers and brand strategists are not employed by companies to create communications – they are employed to create change in consumer behavior. Instead of deluging customers with messages about the point a brand is trying to make, imagine how a brand might let customers experience the point it’s trying to make. 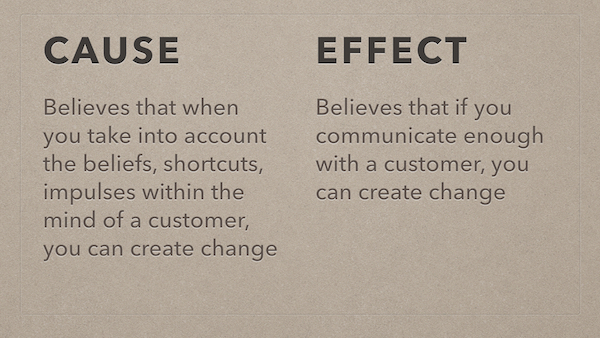 This subtle, but powerful shift moves customers up the ladder of marketing effectiveness*. Instead of absorbing a message (theoretically), customers begin to interact with the brand (practically). 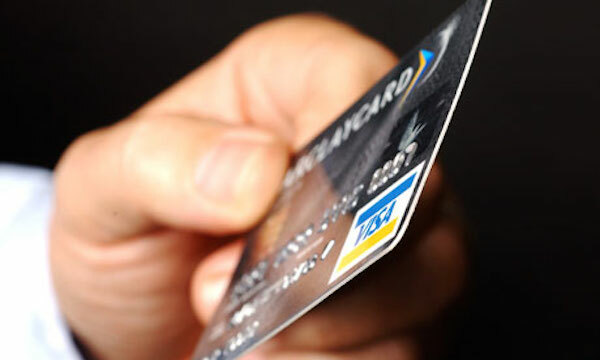 Take credit cards as a first example: Most of the revenue made by credit card companies comes from card use. Many card companies have automatic budget alerts, monitors, trackers, and smartphone apps – these all help customers perceive they are better in control of their finances as they have something easy and practical to help them economize. They go beyond the message by designing an immersive program that encourages sustained interaction with the product. Who doesn’t want more control of their finances? And what card company doesn’t want more point of sale and transaction fees? A win for both, and the message is only a small part in the program design. A second example is a simple shift in how an offer is framed using the principle of defaults in choice architecture. Default choices can create a perception of ownership in the minds of consumers, and has been successfully used by mobile phone companies. Instead of “signing up to get 500 minutes”, they offer an assumptive close: “Your 500 minutes are waiting. What will you do with them?” In this case, the customer perceives the minutes are already waiting. The sheer volume of communications these days demands increasing amounts of our scarce time. It is not a stretch to understand how even important messages are quickly replaced with other important messages. How can anything stick? Brands want customers to do something “try, buy, enroll,” but also to share and evangelize about what is unique about the experience with the brand. When customers do that, they’re no longer just customers, they’re human media.